Blend into Margaritas ~ Icy-cool margaritas are the emblem of any fabulous fiesta. Refresh your next pitcher with crisp cubes of watermelon! The pretty-in-pink fruit sweetly tames the punchy flavor of face-scrunching lime. Deck your glass rims in sugar for a sweet-as-candy finish. Tip: Leftover watermelon? Use remaining round slices for cute and creative coasters! If desired, freeze cubes of watermelon on a waxed paper-lined tray for 1 to 2 hours or until firm. Place salt on a small plate. Rub rims of eight glasses with one of the lime wedges. Dip rims of glasses in salt to coat; set aside. In a pitcher combine Triple Sec, tequila, lime juice, and sugar. Stir until sugar is dissolved. Pour 1/4 cup of tequila mixture into blender or food processor with chopped watermelon (working in batches if necessary). Cover and blend or process until smooth. Strain through a fine-mesh sieve. 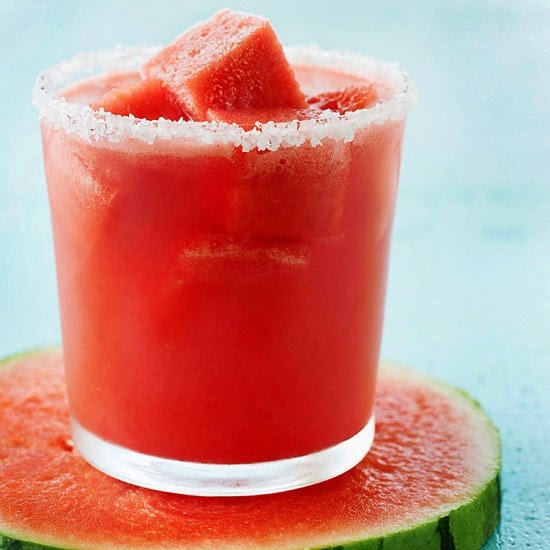 Combine watermelon juice with remaining tequila mixture. Stir. Chill until ready to serve. Place frozen watermelon cubes, if using, in salt-rimmed glasses. 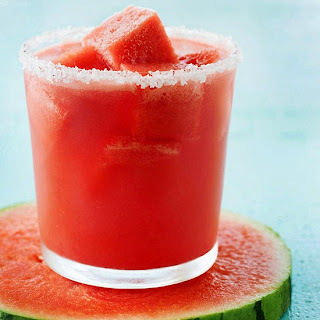 Pour tequila mixture over watermelon cubes. Garnish with remaining lime wedges. Freeze for Fruit Pops ~ Swap that old box of store-bought ice pops for a tray of rejuvenating, DIY watermelon pops! 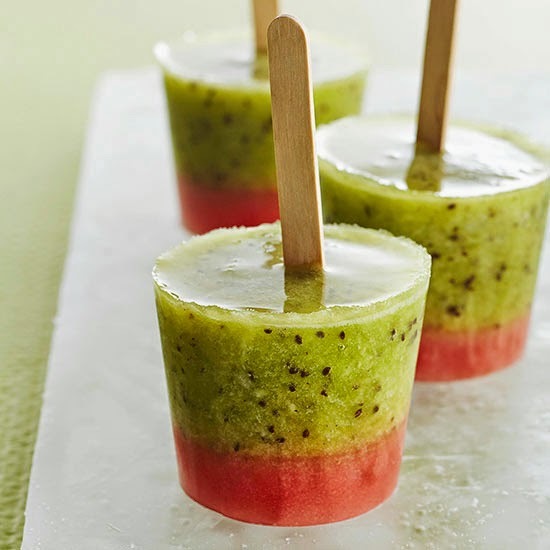 The frozen goodies layer slushy watermelon and tropical kiwifruit for the perfect poolside treat. In a small bowl combine the water and sugar, stirring until sugar dissolves. In a blender combine watermelon cubes and 1 tablespoon of the sugar-water mixture. Cover and blend until smooth. Divide mixture among paper cups. 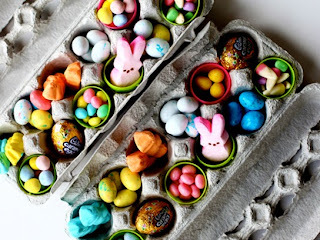 Cover tops of paper cups with foil. Cut a slit in the center of the foil on each cup; insert a wooden stick through each slit, about halfway into the mixture. Place cups on a small baking sheet. Freeze for 1 to 2 hours or until thick and slushy. In a blender combine kiwifruits and the remaining sugar-water mixture. Cover and blend until smooth. Remove foil from paper cups. Pour kiwifruit mixture evenly over watermelon layer in cups. Freeze for at least 4 hours or until completely solid. To serve, peel away paper cups. 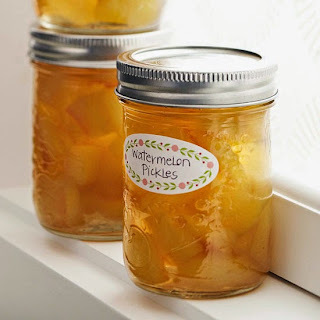 Make Pickles ~ Watermelon pickles? That's right! Save, slice, and soak the pale green rinds of summer's favorite fruit in white vinegar and homey cinnamon for a snack you can enjoy year-round! Cut rind from watermelon (you should have about 4 1/2 pounds rind). Trim off the pink flesh and the green and pale green outer portions of the watermelon rind; discard those portions. Cut the rind into 1-inch squares or other shapes. Measure 9 cups rind. Place the 9 cups rind in a large nonmetal bowl. In another large bowl, combine the 6 cups water and the pickling salt; pour over rind (add more water, if necessary, to cover). 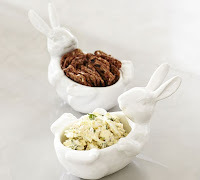 Cover bowl and allow to stand at room temperature overnight. Pour the rind mixture into a colander set in sink. Rinse mixture under cold running water; drain well. Transfer rind to a 4-quart heavy pot. Add enough cold water to cover rind. Bring to boiling; reduce heat. Simmer, covered, for 20 to 25 minutes or until rind is tender; drain. 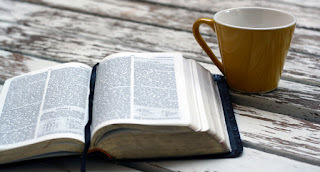 Meanwhile, for syrup, in a 6- to 8-quart stainless-steel, enamel, or nonstick heavy pot, combine sugar, vinegar, the 1 1/2 cups water, the stick cinnamon, and cloves. Bring to boiling, stirring until sugar dissolves; reduce heat. Simmer, uncovered, for 10 minutes. Strain mixture through a sieve, reserving liquids. Discard solids and return liquids to same pot. Add watermelon rind to syrup in pot. Bring to boiling; reduce heat. Simmer, covered, for 25 to 30 minutes or until rind is translucent. Pack hot rind and syrup into hot, sterilized half-pint canning jars, leaving a 1/2-inch headspace. Wipe jar rims; adjust lids. Process filled jars in a boiling-water canner for 10 minutes (start timing when water returns to boiling). Remove jars from canner; cool on wire racks. 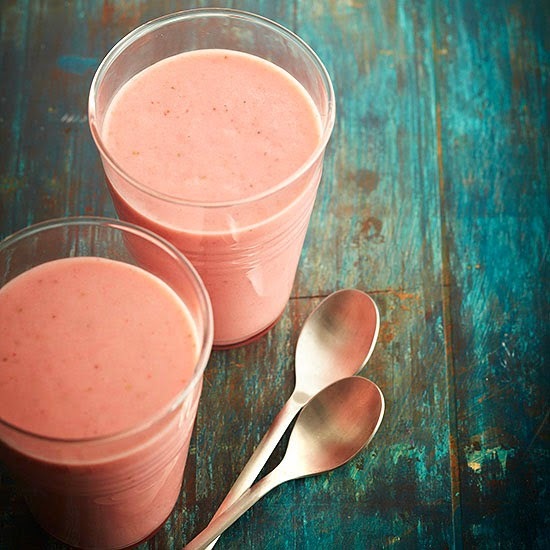 Blend into Smoothies ~ Strawberry isn't the only fruit that makes a knock-your-socks-off smoothie. Toss seedless watermelon into the blender, along with fresh cauliflower florets, for the ultimate thirst-quencher. In a small saucepan cook cauliflower in enough boiling water to cover, about 10 minutes or until very tender. Drain and rinse with cold water to cool quickly. In a blender combine cooked cauliflower, watermelon, strawberries, yogurt, and, if desired, strawberry preserves. Cover and blend until very smooth, stopping and scraping sides of blender as needed. Pour into tall glasses and serve immediately. 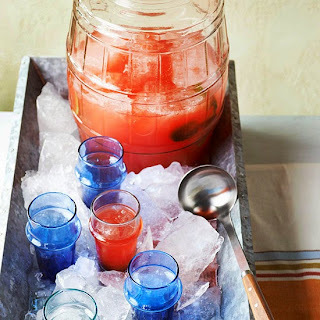 Watermelon-Mint Cooler ~ Greet guests with ice-cold glasses of fizzy watermelon sippers. Using red and blue tumblers, a large ice-filled cooler, and a large jug, you can create a festive 4th of July display. 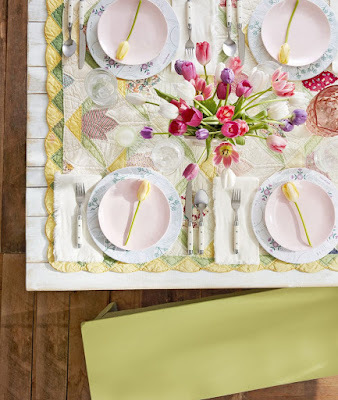 Place in a common area of the party for guests to enjoy. In a blender container place watermelon; puree until smooth. 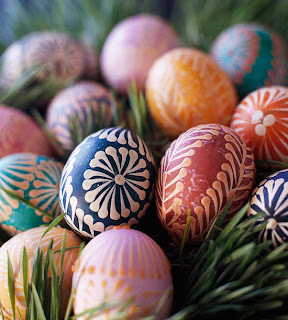 In a small heatproof bowl, use a wooden spoon to mash mint leaves and 1/4 cup of the sugar; add 1/4 cup of the water. Microwave on high until fragrant, 1 to 2 minutes. Using a slotted spoon, transfer mint leaves to blender, leaving sugar in bowl. Blend until chopped. To bowl of sugar mixture add the remaining 1/4 cup sugar and 1/4 cup water. Microwave until sugar dissolves into a syrup, 1 to 2 minutes. Cover and chill. To serve, strain watermelon mixture into an ice-filled pitcher or jar. Stir in syrup, lime juice, and bitters. Divide watermelon mixture among ice-filled glasses; top with ginger ale. garnish with mint sprigs.